The year is ending and Christmas is over so it is time to start looking forward. For Metal heads and music lovers alike they wish to know what fresh new sounds to keep their ears and eyes out for. The first potential one comes in this review. 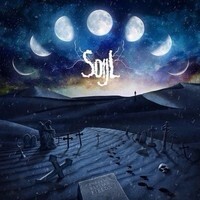 It’s speaks of a debut album titled “Endless Elysian Fields” and it was ingeniously concocted by Swedish Doom outfit SOIJL. The birth of SOIJL happened in the magical breeding grounds of Sweden and as the Metal community knows it has a sterling reputation for producing some of the best sounds on the heavier end of the music spectrum. SOIJL was formed in the year 2014 by Mattias Svensson and Henrik Kindvall; Mattias had been writing Doom since the first time he picked up a guitar. After performing in SATURNUS for a couple of years, SOIJL were truly born. “Endless Elysian Fields” is their first full length album and it is a masterpiece that consists of grand, majestic tunes that sounded as if they were recorded in the deepest darkest parts of hell and earth. In terms of Doom Metal this is huge praise for this fairly new band, this album contains everything a Doom album should have; aggression, sweeping melodies, obscurity and passion. Every song showcases this to the absolute best of their ability. One of the best examples of this work is the track “Swan Song”; this aggressive yet majestic track seems very pertinent for the animal in the title since we all know swans are graceful yet vicious. This song contains sombre guitar riffs, mesmerising choirs and a dominant growl that does more than show us who is in control. Another great example is the concluding track “The Shattering”; it again demonstrates the elegant yet destructive music; it’s beautiful and majestic yet hard hitting. SOIJL are further proof that aggressive and elegant can be used to describe something incredibly spectacular. A spellbinding masterpiece from an ingenious band that every metal head should listen to.